8 August 1914: Entered the Army as a War Volunteer in the Füsilier-Regiment General-Feldmarschall Graf Blumenthal (1. Magdeburgisches) Nr.36. 7 October 1914: In the field with Fusilier Regiment 36. 11 March 1915: Transferred as a Fahnenjunker to the Replacement Battalion of the Colbergsches-Grenadier-Regiment Graf Gneisenau (2. Pommersches) Nr.9. 19 April 1915-12 June 1915: Detached to the Instruction Course for Fahnenjunker in Döberitz. 13 September 1915: In the field with Grenadier Regiment 9. 31 January 1916-13 February 1916: Detached to the Officer Training Course in Zborow. 20 September 1916: Transferred to the 1st Replacement Machinegun Company of the III Army Corps. 30 November 1916: Transferred to the 3rd Company (Machinegun) of Grenadier Regiment 9. 1 January 1917-2 February 1917: Detached to the Machinegun Weapons Officer Course in Döberitz. 9 February 1917: Battalion Adjutant in Grenadier Regiment 9. 19 September 1918: Transferred to the Replacement Battalion of Grenadier Regiment 9. 31 October 1918: Transferred to the Army High Command 17. 7 November 1918: Transferred to the Field Recruit Depot of the 16th Reserve Division. 3 December 1918: Adjutant of the Field Recruit Depot of the 16th Reserve Division. 17 December 1918: Transferred to the I. Replacement Battalion of Grenadier Regiment 9. 22 December 1918: Adjutant of the I. Replacement Battalion of Grenadier Regiment 9. 30 December 1918: Battalion Adjutant in Grenadier Regiment 9. 13 January 1919-22 February 1919: At the same time, Deputy Regimental Adjutant of Grenadier Regiment 9. 8 April 1919: Adjutant of the I. Battalion of Reichswehr Infantry Regiment 3. 4-17 August 1919: Detached to the Course for Light Athletics at the Berlin Stadium. 1 October 1920: Adjutant of the I. Battalion of the 4th (Prussian) Infantry Regiment upon the formation of the new Reichsheer from the Übergangsheer or Transitional Army. 1 October 1922: Transferred to the Mortar Company of the 4th (Prussian) Infantry Regiment. 8 April 1924-24 May 1924: Detached to the Mortar Firing Course in Königsbrück. 29 September 1924-9 November 1924: Detached to the Surveying Course at the Troop Training Area Döberitz. 3 October 1927-15 February 1928: Detached to the Officers Weapons School Course in Dresden. 1 January 1928: Signals and Welfare Officer on the staff of the 4th (Prussian) Infantry Regiment. 27 February 1928-31 March 1928: Detached to the 2nd (Prussian) Signals Battalion. 1 October 1928: Regimental Adjutant of the 4th (Prussian) Infantry Regiment. 12 April 1932-29 April 1932: Detached to Mortar Course C in Döberitz. 1 October 1932: Company Chief in the 4th (Prussian) Infantry Regiment. 15 October 1935: Company Chief in Infantry Regiment 4. 10 December 1935: Detached to the Reich War Ministry (P 1). 1 April 1936: Consultant in the Army Personnel Office/Reich War Ministry; renamed the Army High Command on 4 February 1938. 1 October 1940: Department Chief in the Army Personnel Office/P 1/Department 2/Army High Command. 1 May 1942: Army High Command Leader Reserve. 5 May 1942: Detached to the Battalion Leader School in Mourmelon, France. 20 June 1942: Commander of Infantry Regiment 4 of the 32nd Infantry Division on the Eastern Front. 10 May 1943: Army High Command Leader Reserve. 1 August 1943: Leader of a Grenadier Regiment in Division “E” (a field replacement division). 8 September 1943: Army High Command Leader Reserve. 17 December 1943: Army High Command Leader Reserve. 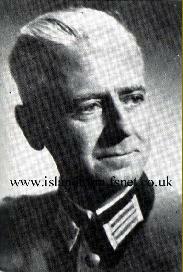 15 January 1944-8 May 1945: Fortress Commandant of Stavanger, Norway. 8 July 1945-17 May 1948: Prisoner of war in British captivity. NOTE: Generalmajor von Boltenstern’s World War II decorations, if any, are not known. However, he was not a recipient of any high decorations such as the Knight's Cross of the Iron Cross, Knight's Cross of the War Merit Cross with Swords, or the German Cross in Gold/Silver.